Obama to announce modest executive actions tightening U.S. gun laws. 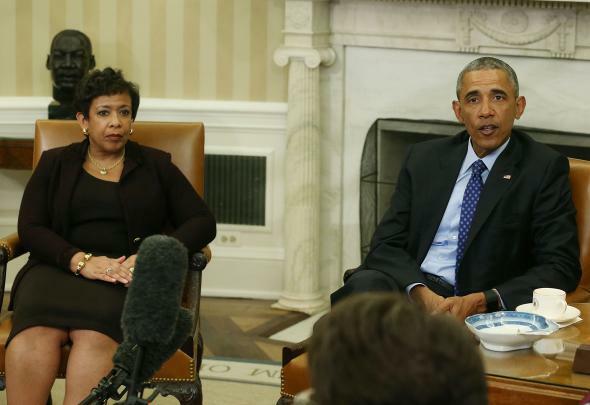 President Barack Obama speaks about gun control during a meeting with U.S. Attorney General Loretta Lynch in the Oval Office at the White House January 4, 2016 in Washington, DC. The White House will announce Tuesday executive actions aimed at combating gun violence through the expansion of background checks and stricter federal enforcement of existing gun laws. “But faced with clear legal limitations on his authority, Mr. Obama will stop well short of the kind of large-scale changes to the gun trade that he unsuccessfully sought from Congress three years ago,” according to the New York Times. The result is modest changes that have prompted Republican backlash and likely will face a court challenge.